Due to this year’s opening of Magnolia Intermediate School, which is located directly behind MJH, the district has implemented a new car-rider drop-off and pick-up plan designed to accommodate the needs of both campuses while reducing traffic on Nichols Sawmill Rd. This change, however, requires some adjustments to our previous procedures that will be important for parents to observe once we begin the school year. As you can see in the maps below, car-rider drop-off and pick-up will no longer take place at the front of the building. All car-rider traffic will now be rerouted to Sanders St. and directed through a loop that will lead to a drop-off zone on the east side of MJH. In the morning, all students will enter through the bank of doors labeled “Gymnasium” on the awning above. This is also where all visitors and parents will enter the building until classes begin at 7:15 a.m. During morning arrival, a reception desk will be stationed in this area to receive visitors and parents; however, all reception functions will transition back to the front of the school for the remainder of the day after 7:15 a.m. In the afternoons, the front drive will be closed beginning at 2:15 p.m. to help route car-rider traffic to the designated pick-up location, but visitors and parents with appointments or in need of assistance will still be able to park in the front and check-in at the main reception desk. No car-rider pick-up, though, will be permitted in this area. Car-rider traffic traveling eastbound (indicated by yellow lines) will bypass the front of MJH and turn on Elm St to access the Sanders St. loop. Those traveling westbound (indicated by blue lines) may either turn on Nichols Sawmill Rd and take either Commerce St or Elm St to merge with Sanders or can simply turn on to Sanders St directly. Once in the loop, cars should remain in a single-file line through the turn to the designated Drop-off/Pick-up Zone on the east side of the school. Vehicles will be instructed to pull up as far as they are able in this zone to enable the most efficient loading and unloading of students. Students must only exit or enter vehicle doors on the curbside, as cars will be permitted to pass in the left lane. 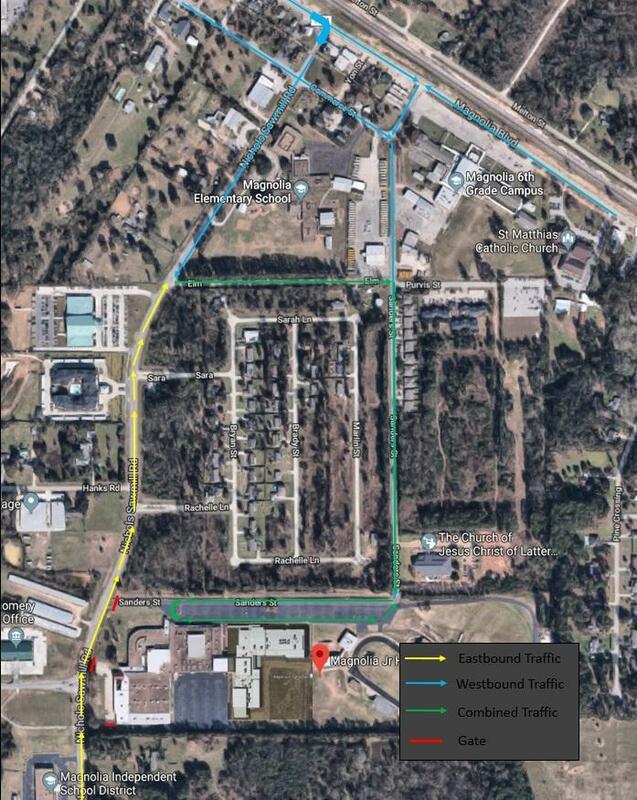 Once their students have loaded or unloaded, vehicles will follow the loop in front of Magnolia Intermediate and exit via Sanders St. in the opposite direction. 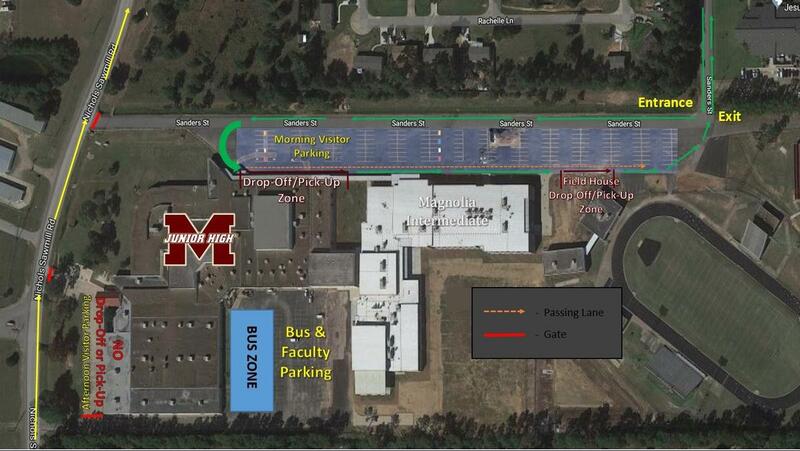 Parents with a son in Athletics may also choose to use the Field House Drop-Off/Pick-Up Zone, which is further down the loop in front of the Field House. If it is clear, vehicles may use the passing lane to access this zone directly, but following the Sanders St. loop all the way around with other MJH traffic is mandatory. As with any new procedure of this magnitude, there will be a period of adjustment and modifications may be made along the way to improve its implementation. During this time, we hope that you’ll work with us to ensure a smooth and efficient transition to this new procedure.